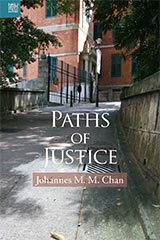 Description: In Paths of Justice, Johannes Chan illuminates fundamental themes and basic values in Hong Kong’s legal system by using his own experience and drawing on interesting and important cases. The book explains and demystifies some of the most frequently asked questions about the law: How does a lawyer defend someone who is guilty? Does the law favour the rich and the resourceful? Is there a duty to obey the law in all circumstances? How can human rights and national security coexist in balance if their goals conflict in certain situations? How can fairness be reconciled with administrative efficacy? Is an abuse of freedom a justification for denying it? He also casts light on legal profession and professionalism, arguing that the legal profession is honourable only because lawyers, by and large, do live up to a high ethical standard and are committed to the values of justice and fairness. Professor Chan was recently interviewed by the SCMP on 9 July 2018 and by Deutsche Welle on 29 June 2018.